Children love animals and want to learn everything about them. These cards teach external anatomy the way it was meant to be done. Using a mix of full-color and black-and-white photography, each part of the whole is clearly isolated in its natural color while the rest of the subject recedes into the background in muted shades of gray. Within each packet there is one photo that depicts each key external anatomical part for that species. 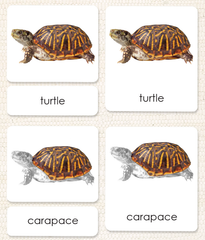 For example, in the turtle packet there is one card showing the entire turtle in full color and then one card for each of its key parts where only that part of the photo is in full color (head, tympanum,eyes, nostrils, jaw, neck, carapace, plastron, forelegs, hind legs, clawed feet, and tail). Approximate card sizes are 3¾” x 4¼” (control cards), 3¾“ x 3” (photo cards), and 3¾” x 1¼” (word cards). These packets are also available in Book and Definition Card formats for a complete learning experience. 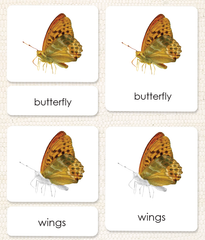 For more information, download our free lesson plan describing how to use "Parts of" Cards. Also, if you're curious as to why we no longer offer black & white outlines to accompany these cards, read this article from the Public School Montessorian. "How delighted I am with your language materials, both for the toddlers and for the 3-6 year olds. It's so refreshing, for example, to see a real leaf with highlighted parts, rather than the stylized leaf so many of us have grown up with. How wonderful to have both options! I think your images would be great for toddlers as well - not the labels, just the images. I appreciate your commitment to excellence and standards. 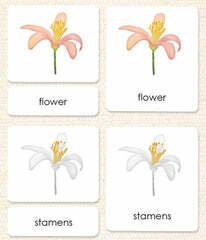 Thanks,"